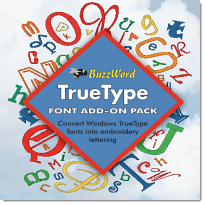 Find out more about the BuzzEdit 4 Toolkit products. It's time to fall in love with your embroidery software. 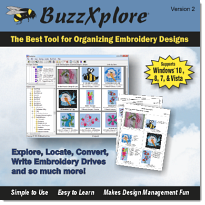 Buzz Tools, Inc.
TOP SELLER - Embroidery Design Management software. You can convert formats, view thumbnails, drag-n-drop to organize. Prints catalogs & templates too! 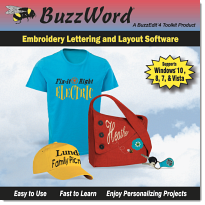 NEW VERSION 4 - Personalize your embroidery projects with 49 built-in letters. With lots of new features, this software is sure to please all user levels. 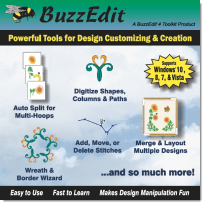 NEW VERSION 4 - You will be amazed at what you can do with BuzzEdit. It's a powerful stitch editor, an auto-hooping program, a layout program, a basic digitizing program and more! 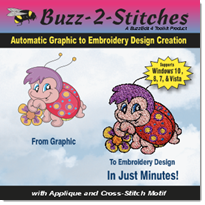 NEW VERSION 4 - It's easy to turn graphics into beautiful embroideries with just a few simple choices. Great for beginning and experienced hobbyists! 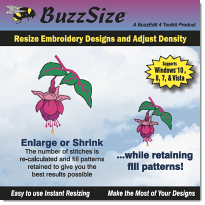 NEW VERSION 4 - Easily resize your embroidery designs or adjust stitch density while preserving the original fill pattern. Recalculates the number of stitches for best results. Want to know what's happening at Buzz Tools? For general news, articles, updates, downloads and more, visit our NEWS page. If you want us to let you know via email what's new and to receive exclusive goodies, please sign up for our newsletter below.